My first trip up was in mid-March so there was still quite a bit of snow, but I was so glad to experience the trail in a winter season. It was truly breathtaking and I cannot recommend it enough. There is a mix of trees as you hike up so you feel as though you are in a winter wonderland and then at the top the trees part to reveal this beautiful frozen lake that makes you feel like you’ve just discovered Narnia. If you do hike in March you’ll also get to see all the Maple lines running through the woods. Ben’s Sugar Shack is just down the road on NH 103 and they run their lines for miles through the woods. I’ve seen maple lines but never any this large or long, it’s an experience in itself. Plus at the end of your hike, they are the perfect stop for a post-workout local treat! The elevation gain is relatively gradual but still a great workout. It took us 3 hours and 15 minutes to go up and down with a 5 year old girl. That’s with her walking up and down on her own 90% of the way and us taking a snack/picture/soak it all in break at the top. The trail is reasonably marked, just keep your eye out for the markers and there are a couple of small streams you have to navigate over the first mile up. The hike up is through tree line so you are sheltered in the winter. We had 22 mph winds the day we hiked and were more than comfortable hiking up. We shed layers after the first half mile. Once you get close to the top there is a small portion of the hike that is more exposed to the wind. We added a layer for that last half mile but you do go back into tree line so it’s more than bearable, and so so worth it! The trail does continue up to a cliff overlook but we decided against it in the winter because the trail meets up with Sunapee ski resort and the wind was a little more bone-chilling. But all the more reason to go back in the summer! Overall I give this hike a 10. I’ve been tackling the NH 4,000 footers the last few years and have experienced some beautiful hikes in the region. This one gives you gorgeous views and scenery without the effort or time of a 4,000 footer. It’s great for families and people who like half day hikes...aka my fiance who has about a 3-hour attention span when it comes to hiking 😉- this one pleases us both! The Andrew Brook trailhead does populate in Waze so you can trust your navigation, but service does get spotty so enter it in before you head there. I always like to take a screenshot of written direction as well just in case so here you go! ANDREWS BROOK TRAIL HEAD: From NH 103 just east of Newbery take Mountain Rd for 1.2 miles. The trail head can be tough to spot but it’s right before the 3rd small bridge on your right. If you hit a dirt road you have gone too far. 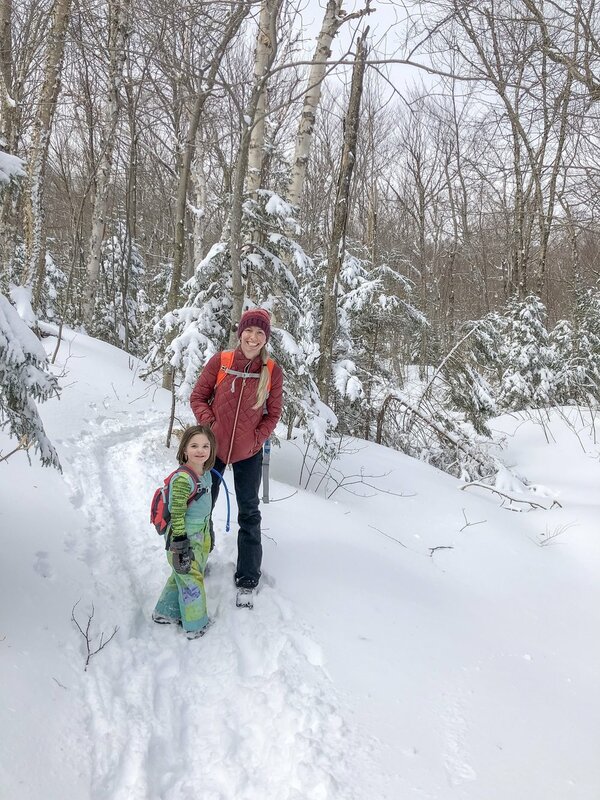 Sunapee Lake is about a mile from Mountain Road so it’s a great hike if you want to explore lake towns or get in multiple activities. Newer PostMade For More or Not Enough?